If The Las Vegas Strip wasn’t the spot to be during Super Bowl weekend before, then it certainly is now. 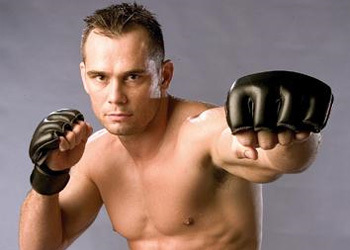 According to multiple outlets, a light heavyweight clash between former Octagon champions Rich Franklin and Forrest Griffin will co-headline one of the most star-studded fight cards in UFC history. MMAFighting.com was the first to report the February 5th tussle, however it has since been confirmed by everyone under the sun. Although nothing has been officially announced by the world’s premier mixed martial arts show, the MGM Grand Garden Arena in Nevada is expected to host the shindig. A middleweight title scrap between champion Anderson Silva and Vitor Belfort will headline the pay-per-view broadcast, which will likely be dubbed UFC 127. Franklin was last seen in June knocking out former king Chuck Liddell at UFC 115. Prior to the win, the former middleweight title holder had dropped two of his last three contest, including a split decision defeat to Dan Henderson and a TKO loss to Vitor Belfort. A unanimous decision win over Wanderlei Silva was sandwiched between the two losses. Griffin, meanwhile, returns to competition for the first time since taking home a close split decision win over Tito Ortiz at UFC 106. The much needed November victory came after back-to-back losses to Rashad Evans and Anderson Silva, respectively. “The Ultimate Fighter 1” winner was expected to fight Antonio Rogerio Nogueira at UFC 114, but was forced to pull out of the bout with a shoulder injury.